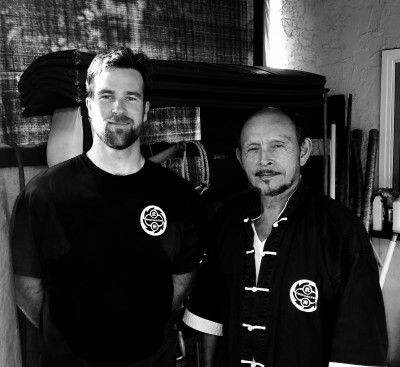 Sifu Nick Wright started his martial arts training in 1992 studying Japanese Karate and Korean Tae Kwon Do. Later on he spent time learning Japanese Aikido. It wasn’t until he discovered the art of Choy Lay Fut Kung fu that he found his calling in the martials arts. Sifu Nick trained under the highly respected and well known teacher of Choy Lay Fut Sigung Frank Primicias for over the last ten years. He continues to study with Sigung Primicias on a regular basis to develop his Kung Fu and personal growth. Training Choy Lay Fut with Sigung Primicias has been an incredible journey and has changed his life beyond what he could have ever imagined. He considers himself an endless apprentice of Kung Fu and the martial arts. Sifu Nick is continually studying the origins of the arts and development of the unique history they share. With this ongoing practice and study Sifu Nick offers a great depth and knowledge of the martial arts to be able to educate and help students grow and understand Kung fu to gain a personal connection to the martial arts. Through intense training and endless study of all martial arts Sifu Nick feels very passionate for the culture and history of the many fighting systems from around the world. He feels that all martial arts have something unique that they offer and if studied properly with correct teaching from a qualified teacher, students can gain great skill to defend themselves and build good character. Sifu Nick continues the focus on teaching the applications of Choy Lay Fut for use in combat as it was taught to him from Sigung Primicias. Where some schools focus on learning many forms and acrobatic displays of Kung Fu, our lineage has been passed down with the first focus of practice being on self defense in a real combat situations. It is through this disciplined practice of Kung Fu we learn to discipline our bodies, mind and spirit. Sifu Nick feels it is absolutely crucial in today’s modern society of martial arts that we teach Kung Fu in a relevant and realistic way. He feels we must not get lost in the myths and legends of history, but to know and understand the system and how it developed and why. Sifu Nick is passionate about keeping the traditions alive without losing the focus of training in an effective combative system of Kung Fu. Sifu Rob Kopp began his martial arts training as many kids do, in a short lived stint in strip-mall Tae Kwon Do. It wasn’t until he was an adult however that Sifu Rob had the opportunity to meet Sigung Frank Primicias and thus begin his training in Choy Lay Fut Kung Fu. Now, over 15 years later, Sifu Rob considers himself to be very fortunate to have that chance meeting and have had the opportunity to learn from one of the greatest Choy Lay Fut masters of our time. Through his training Sifu Rob began to understand the deeper aspects of martial arts. Patients, persistence, and strength of will are lessons to be gained that serve students in everyday life. These fundamental lessons of life are central to the tri-fold development of Mind, Body, and Spirit which is at the core of Choy Lay Fut. Through training Sifu Rob also developed a passion for fitness and nutrition and tries to impart the importance of balanced exercise and proper diet along to his students. Along with a central focus on the practical application of techniques, Sifu Rob specializes in body and endurance conditioning. Author Barrett Tillman put it best saying: “You won’t rise to the occasion – you’ll default to your level of training.” – it is with that in mind that Sifu Rob pushes himself and his students to go farther than they thought they could and break down the walls of self-doubt that tell us to stop.